Disney Animal Kingdom Lodge Restaurants offer some of the best dining choices of all the Disney World Resort Hotels. If you are spending some time at Walt Disney World and you want to experience something completely different you should consider visiting Animal Kingdom Lodge and checking out some of the dining options there. There is nowhere else in North America that you can enjoy fine dining whilst looking out on a savannah which includes giraffes! Animal Kingdom Lodge is a bit out of the way compared to the other Disney World Resorts. However, it is well worth a visit if you can fit it into your schedule. Here is our guide to the best Disney Animal Kingdom Lodge Restaurants. 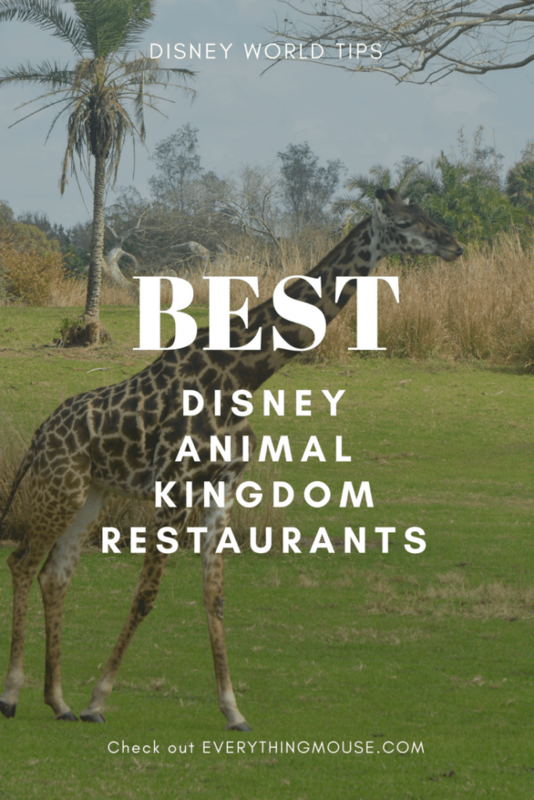 We think that the Animal Kingdom Resort Restaurants are some of the best in the whole of Walt Disney World. Boma was once one of Disney World’s best-kept secrets. 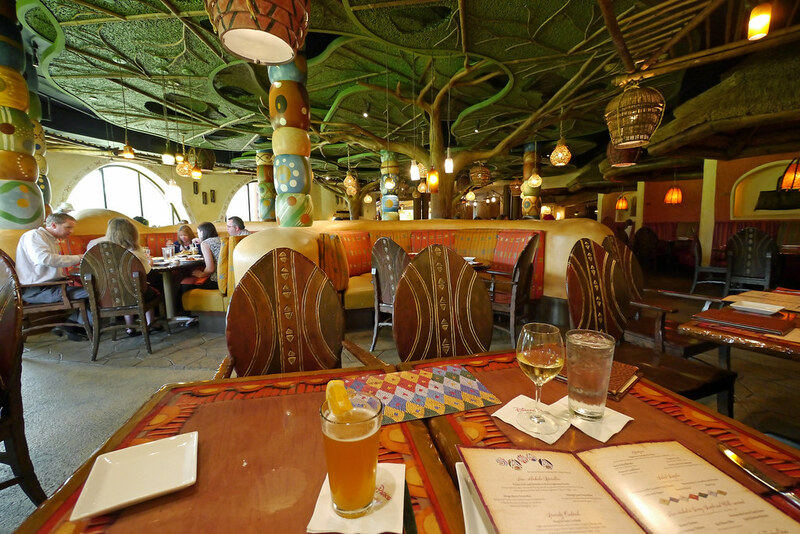 What was once a little known Disney dining restaurant option, Boma has now become one of the most popular of the Disney World Resort Restaurants. The Boma-Flavors of Africa Animal Kingdom Lodge restaurant is truly unique. 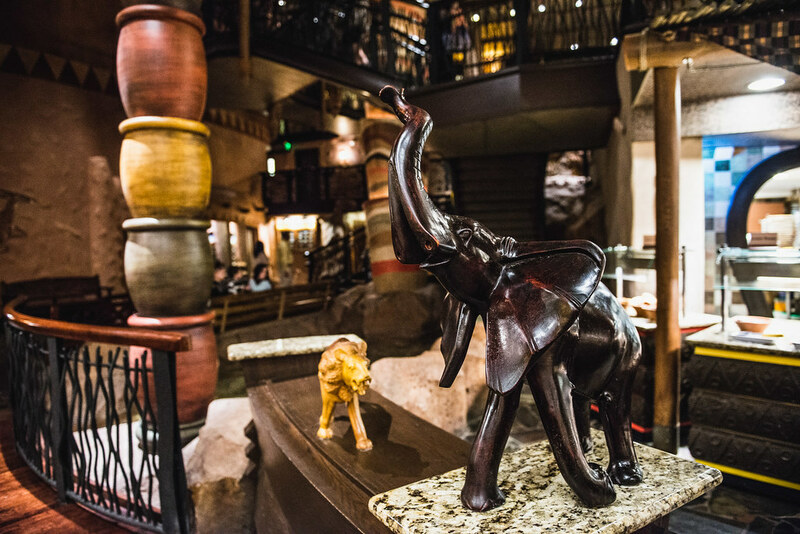 From the welcoming decor to the excellent food, we think that Boma is somewhere which you should have on your Disney restaurant bucket list. Boma definitely has the award from us for being the best Disney Animal Kingdom Lodge Restaurant. It’s a close call with Sanaa, but we think Boma still has the edge. Disney’s Boma serves an all you care to eat breakfast and dinner. The decor at Boma Animal Kingdom Resort Restaurant is beautifully themed. Solid, dark wood furniture coupled with brightly colored materials decorating the ceiling. 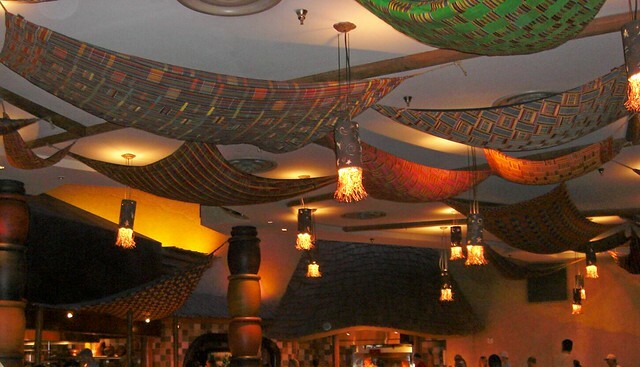 The decor makes Boma a very pleasant place to dine. 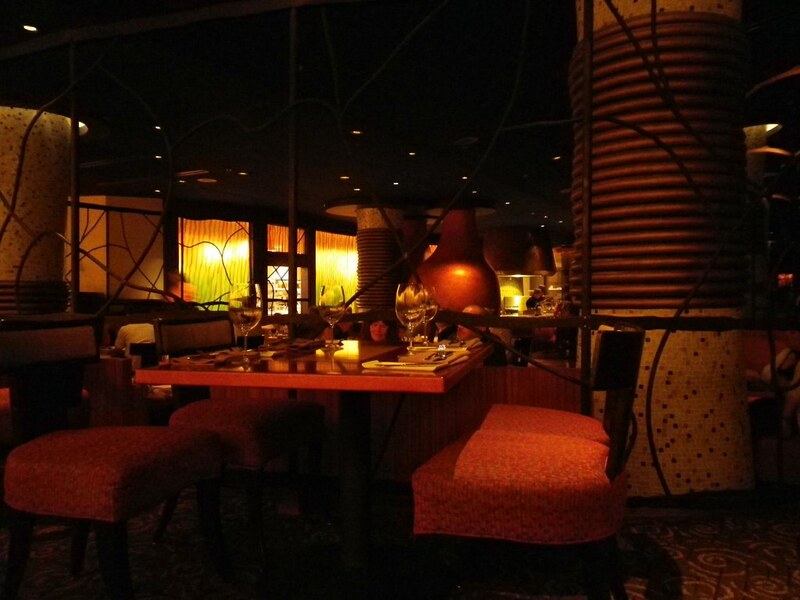 It is loud and the tables are pretty close together, but the ambiance is upbeat and friendly. 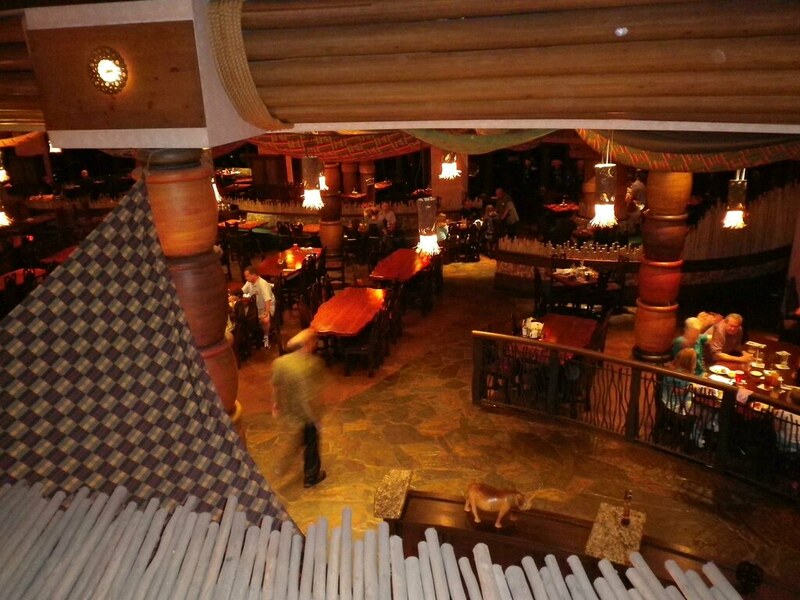 Boma is located in the original Jambo House part of Disney Animal Kingdom Resort Hotel. Either before or after your meal make sure to walk out to the savannah. It is a truly special experience to catch sight of some of the wildlife. Disney Animal Kingdom Resort offers such a unique opportunity to see the animals. If you are looking for a very ample, high-quality Disney buffet breakfast, we think that Disney’s Boma Breakfast is one of the best out there. A Boma breakfast is not the place to meet with the characters. They don’t visit here. However, this helps to keep the price to a slightly more palatable level.The cost of a Boma- Flavors of Africa breakfast is $30.89 for adults and $17.04 for children aged 3 to 9. Breakfast at Boma-Flavors of Africa is one credit on the Disney Dining Plan. If you are really trying to max out your Disney Dining Plan savings, Boma is not a good choice. This is because it is on the lower end of cost of Disney breakfasts. However, if you are not on the Disney Dining Plan, Boma is one of the best values of the Disney buffet breakfasts. The Boma-Flavors of Africa breakfast menu gives you a choice of over 60 items. Some are the traditional breakfast fare which you would expect. Eggs, pancakes, cereal, omelets, bacon, sausage, breakfast potatoes, pastries and breads are available here. If you want a traditional breakfast you will find it at Boma. However, what makes the Boma breakfast unique is that you get a chance to try a lot of different breakfast foods. 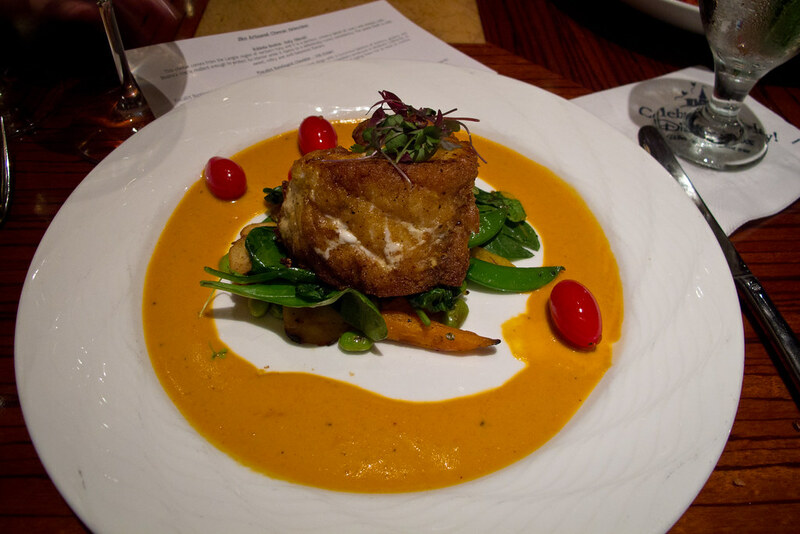 Why not try a Disney Animal Kingdom Restaurant specialty? Turkey Bobotie is a Signature dish here at Boma as well as Tusker House in Animal Kingdom Park. What is Boma’s Bobotie? It is a bit like an English Shepherd’s Pie. It has highly flavored meat with an egg-based topping rather than potato. Certainly worth trying. You may also sample the rather unattractively named Pap. This is one for trying in small amounts. It is a mix of corn flour butter and water. It’s an African staple which is worth trying just to say you have. Chakalaka is worth a taste too. This is a spicy vegetable based relish. Try it on the side. Another great feature of the Boma-Flavors of Africa breakfast is the expanded fruit collection. They have the usual favorites of melon, pineapple and grapes. However, they also offer papaya and mango. 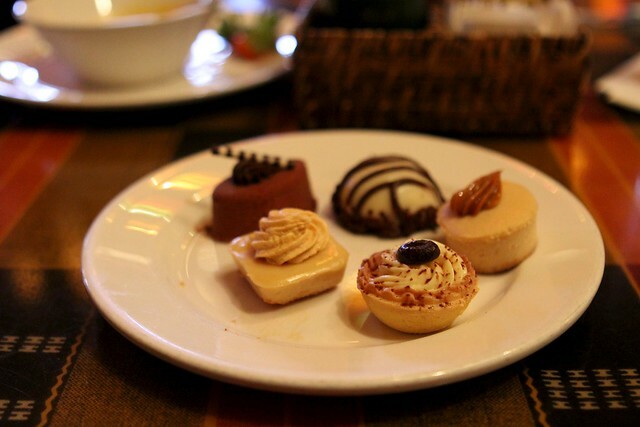 Our favorite is definitely the Boma dinner buffet. It is one of our favorite Disney dining experiences. The price for the Boma dinner for adults is $52.19 and for children is $28.76. This makes the Boma dinner one of the best value Disney dining buffets. 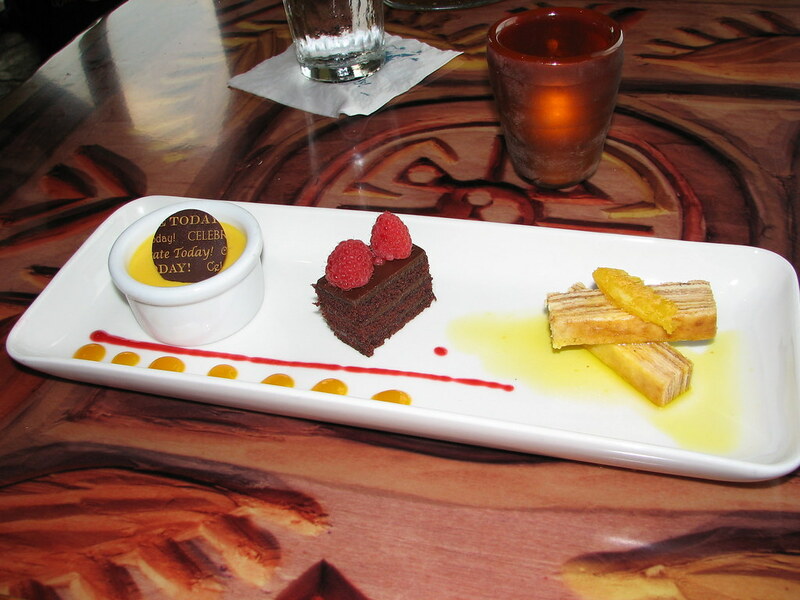 The food at Animal Kingdom Boma is influenced by African flavors. You do have to be a little adventurous with your food to fully enjoy the Boma experience. However, it also offers some standard American fare if you don’t want to try something new. You have a choice of more than 75 different items at Animal Kingdom Lodge Boma. Things do change every day but there is always something great to try. We particularly like the selection of soups and salads. We always have the Spicy Nigerian Peanut Soup and the Carrot Ginger Soup if it is available. The selection of African bread and dips is always worth sampling too. The Lentils and Hearts of Palm Salad is another favorite. There is a great selection of entrees with something always available at the Carving Station. We love to pair the Nut Crusted Salmon with the Peanut Rice. The mashed potatoes are a must have! If you still have room for dessert you will definitely want to try the famous Zebra Domes. The Bread Pudding and the Guava Panna Cotta are pretty difficult to resist. Don’t worry about the kids. 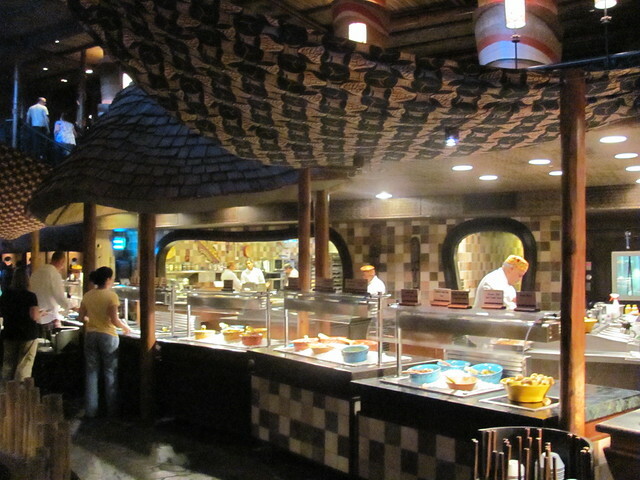 If they really don’t want to try something new there is a kids Boma buffet with the usual favorites. If they just want to eat the usual Mac and Cheese with Fries they can do that here. The price of the buffet includes a non-alcoholic beverage. They have a good selection of South African wine and beer as well for an extra cost. Disney’s Jiko The Cooking Place is also located inside the Jambo House of Animal Kingdom Lodge. We think this is one of the best Disney Signature Dining Restaurants. All Signature Dining Restaurants require two Disney Dining Plan Credits. The decor at Animal Kingdom Jiko is spectacular. It is meant to evoke a feeling of dining outside under the stars on an African safari. The lighting changes as the evening goes on. Look up and you will see a blue sky with birds. Look down on the floor and you will see a beautiful wooden floor with wheat sheaf inlay details. The word “Jiko” literally means a kitchen or oven. The centerpiece of Disney’s Animal Kingdom Jiko restaurant is a huge traditional pizza type stone oven. The one thing which you would expect, but which Jiko doesn’t have, is a view. The only place to even look out of the window is the side wall which overlooks a man-made water feature. It is pleasant. However, it does nothing to rival the view from Sanaa as we will see later in this review. The Animal Kingdom Jiko The Cooking Place menu changes frequently. However, here are some of the items which are available March 2019. Appetizers start at $12 and rise to $20. Favorites include Grilled Wild Boar Tenderloin with Mealie Pap, Chakalaka, Truffle Oil and Micro Cilantro for $19. Charcuterie and Cheese include chef’s selection of hand-crafted meats and artisanal cheeses with seasonal accouterments for $20. The Mauritius Poached Shrimp is a combination of Meyer Lemon-Sumac Vinaigrette, Rougaille Sauce, Pickled Radish, and Chile Oil for $13. If you enjoy something less meat-based you may want to try the Taste of Africa which is African inspired Dips, papadum, sesame fatir, house-made flax seed naan for $15. Entrees at Disney’s Jiko start at $30 for a vegetarian dish and range up to $48 for the Botswana Style Sesswa Beef Short Rib. If fish is more your thing you should try the Bo Kaap Malay Seafood Curry for $47. It has lobster, calamari, red shrimp, mussels, coconut curry sauce, saffron rice. Like many of the Disney Signature Restaurants, Jiko The Cooking Place has a section of the menu devoted to “Enhancements”. This isn’t just another term for side dishes. The Enhancements are not the usual vegetable selection of sides. 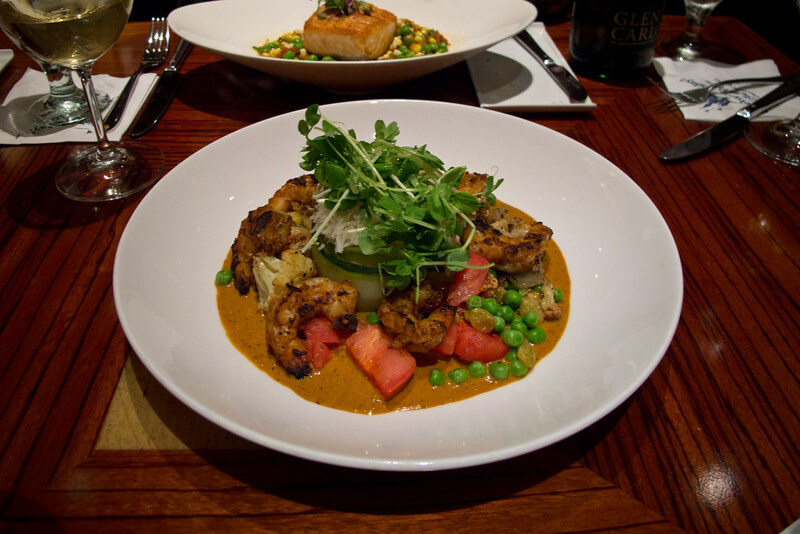 It includes such things as North African Spiced Scallops for $17 and Coconut Curry Shrimp for $16. They used to have a lobster offering as well but this appears to have gone for now. Perhaps the $29 price tag for something to add to your entree cost was a little on the high side! 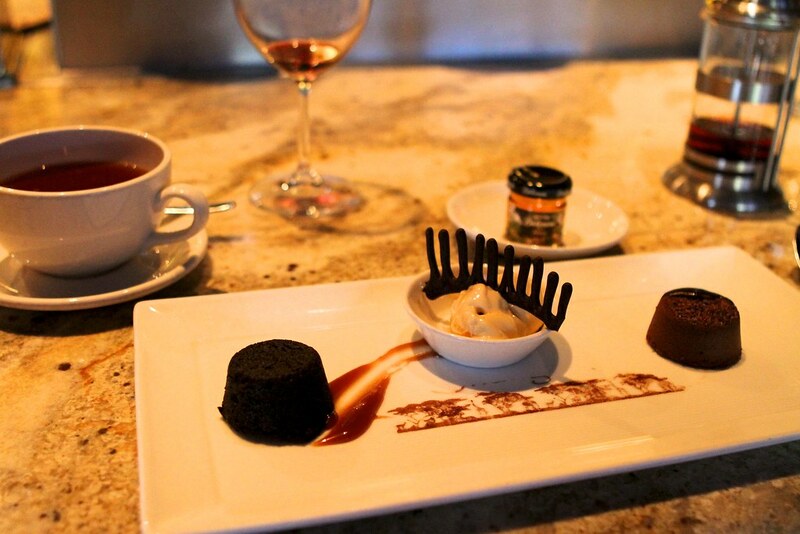 You really should leave room for a Jiko dessert. The Kilimanjaro Jiko dessert is a favorite. This is a combination of Tanzanian chocolate mousse, pistachio financier, pink peppercorn meringue, cacao nib crunch, and pineapple. All for $11. If you want to try something a bit different why not choose the Malva Pudding which is Melktart ice cream, Kataifi, Kanu tuile, and cabernet gelee for $13. Jiko is also known for its excellent African wine list. It is one of the finest collections in North America so you really should indulge in an exceptional wine to accompany your dinner at Jiko. The Jiko dress code is the same as with all Disney World Signature Restaurants. Use your common sense. You do not need to wear a dress or a suit and tie. However, you should not arrive in shorts and flip-flops either. Jeans are permitted if they are “in good condition”. If you book the Wanyama Safari at Animal Kingdom Lodge, you will have an opportunity to sample the food at Jiko as part of your tour. The food is served family style, but it is plentiful with a good variety of dishes to enjoy. Jiko Wine Tasting is a highly recommended thing to do if you are visiting Disney Animal Kingdom Lodge. 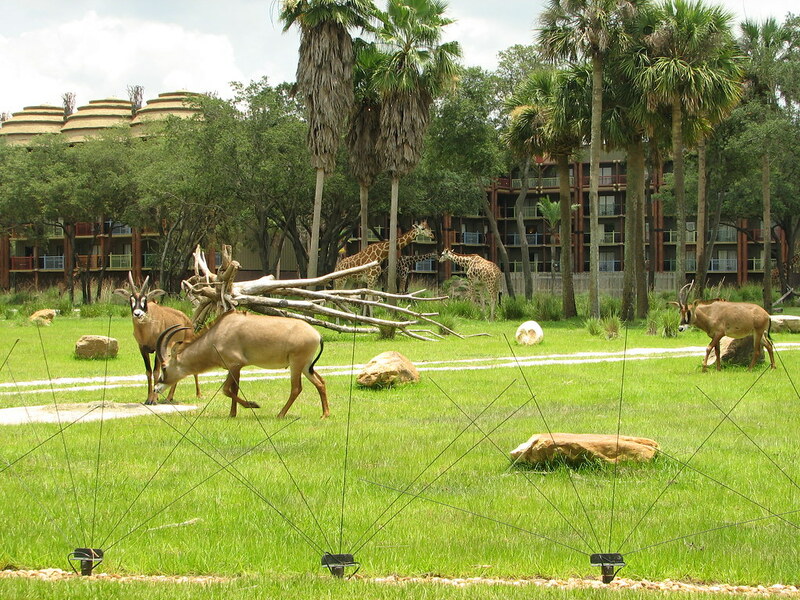 This is one of the little known extra activities that you can do at Animal Kingdom Lodge. Jiko Wine Tasting takes place each Wednesday afternoon from 3 pm to 4 pm. This event is very popular so if you want to do the Wine Tasting at Jiko you have to book ahead. The Jiko Wine Tasting cost is $25 plus tax and tip. You will be given 3 wines to taste with 3 different cheeses. It’s a fun thing to do and highly recommended. 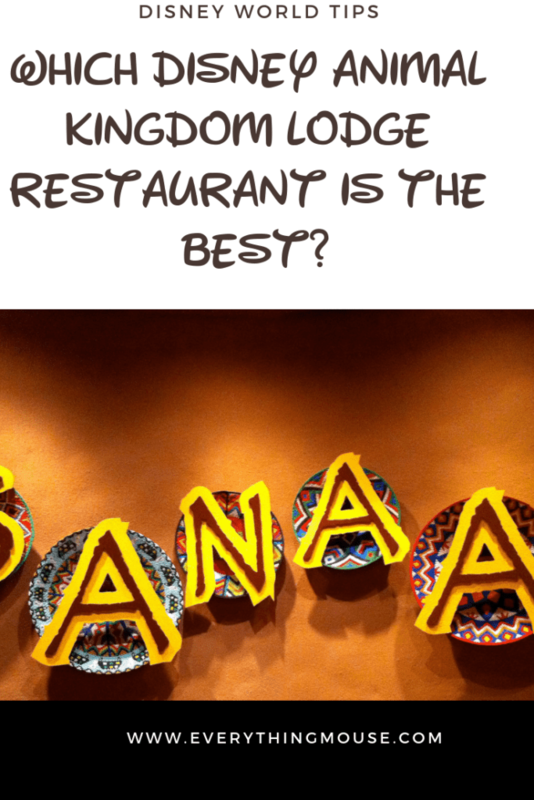 If you didn’t know that Disney Animal Kingdom Sanaa restaurant existed, you are highly unlikely to stumble upon it. Sanaa has the dubious distinction of perhaps being the most remote of any of the Disney World Restaurants. Disney Sanaa is hidden away in the Kidani Village part of Animal Kingdom. 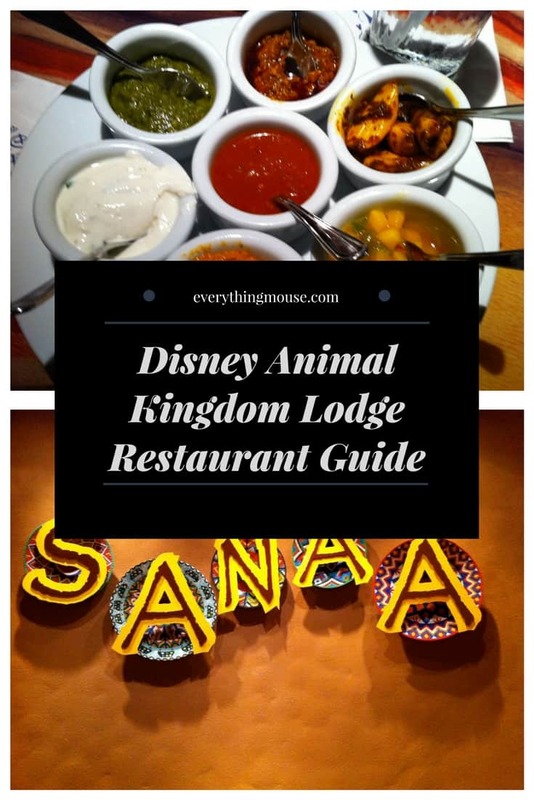 A little out-of-the-way it may be, but a trip to Disney Animal Kingdom Resort Sanaa is well worth it. Not just because Sanaa has great food. The view from the restaurant is breathtaking. The huge picture windows ensure that you will be able to watch the animals go by as you dine. The view over the savannah in Sanaa restaurant is certainly unique. 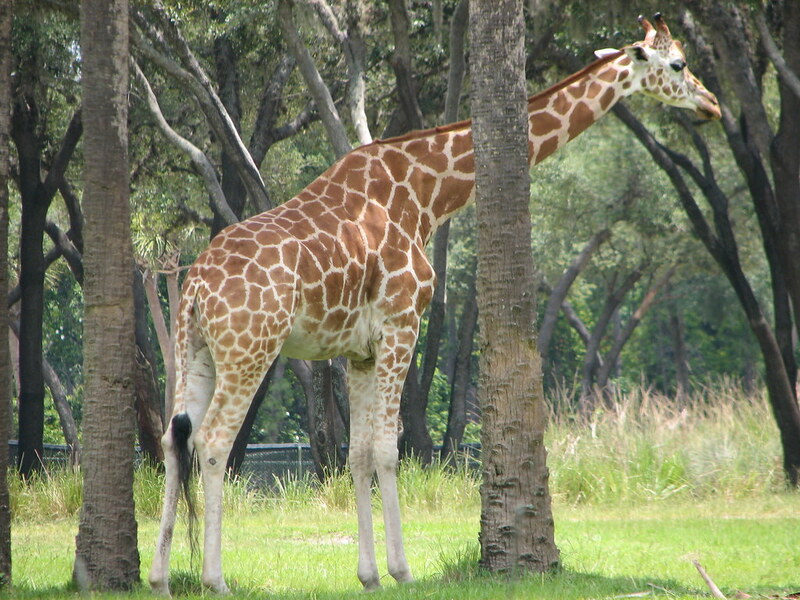 Where else in North America can you dine and watch giraffes just feet away from you? Sanaa serves breakfast, lunch and dinner. 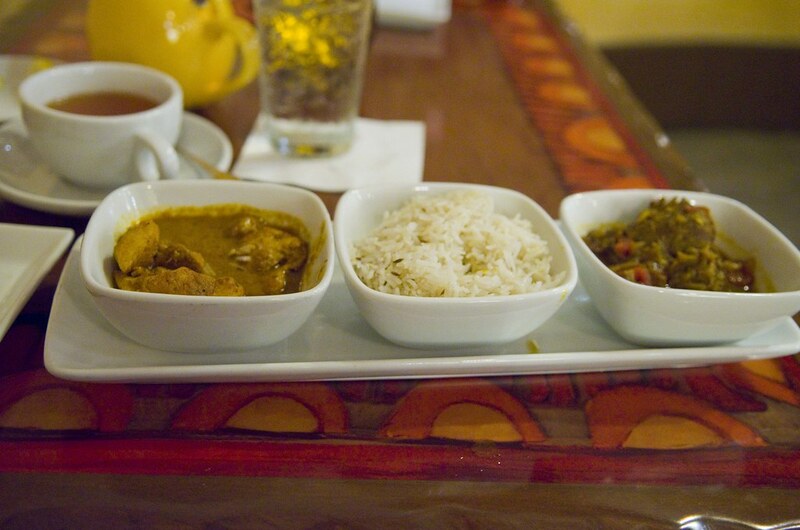 The menu at Sanaa is African and Indian inspired. The servers are very good and will listen to your preferences if you do not like your food overly spicy. Most of the dishes are very flavorful rather than just highly spiced. Don’t worry about the kids at Animal Kingdom Sanaa. There is the usual Kids Menu with Mickey Check Meals. They can choose something different if they want, but there is always the good old mac and cheese or pizza as a standby. Breakfast at Sanaa is served from 7 until 10 am every morning. You order your meal at the register and then go and find a table. Obviously, the most sought after tables at Sanaa are close to the window. If you want to increase your chances of getting a window table go to breakfast as close to 7 am as you can. The food is brought to your table. The selection is good with your usual favorites with a slight twist. A popular choice is the Boere Breakfast which is two cage-free eggs any style, tomato chutney, Tanzanian hash browns, Boerewors sausage, bacon and a corn Johnny cake for $10.99. A more traditional choice is the Safari Waffle which is topped with seasonal berries and chai whipped cream and priced at $8.99. The Sunrise Sandwich is a reasonable $6.99 and has scrambled eggs, bacon and cheddar cheese served on a croissant. If you aren’t that hungry at breakfast time there are some lighter items such as fruit and oatmeal. 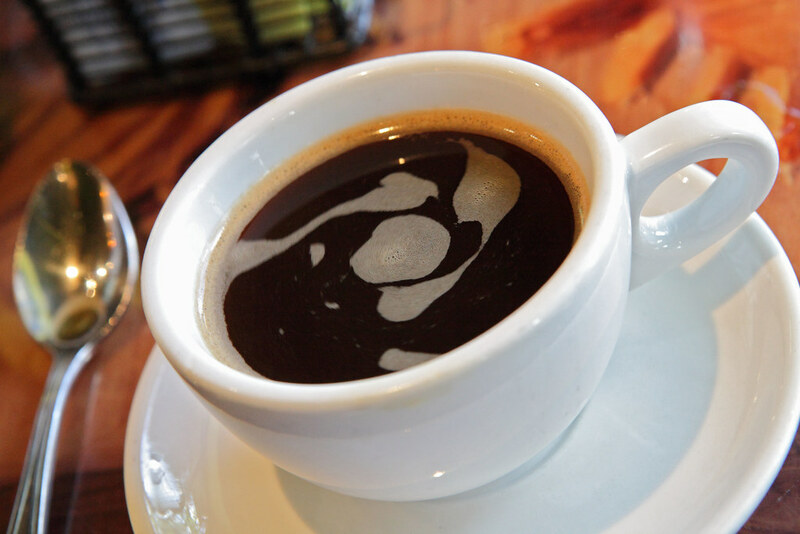 If you are a coffee fan you should try the Press Pot Coffee. At $7.50 you may think that is on the high side, but there is enough for two. It is Kenyan A/A 100% Specialty Grade Arabica Coffee so we think it is worth it. Lunch is served from 11.30 until 3 pm. Dinner is served from 5.30 to 9 pm. Lunch has a smaller menu than dinner. The big advantage of lunch at Sanaa is that it will be light outside so you will get a great view of the animals. The most sought after tables are the ones right next to the window. However, you can see the savannahs from most places is Animal Kingdom Resort Sanaa Restaurant. If you dine at Sanaa you really must try the Indian-style Bread Service. 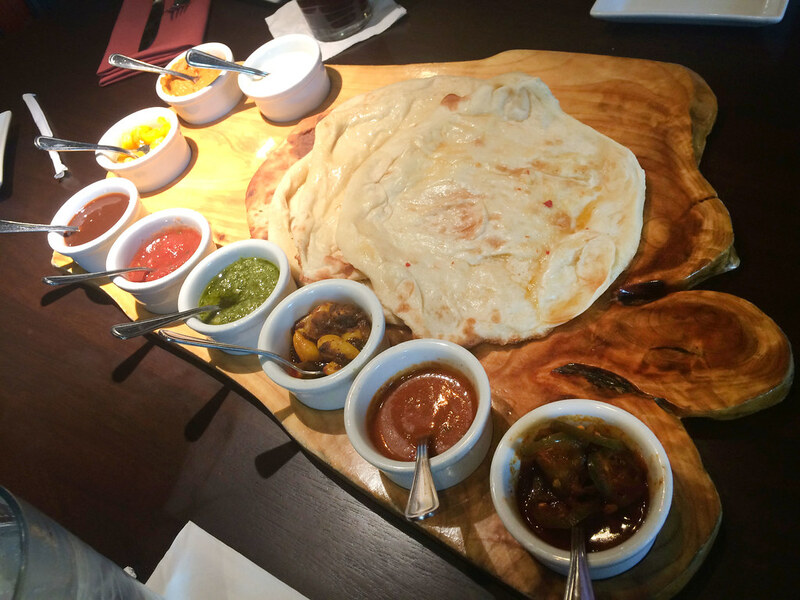 You have a choice of different types of Naan Bread and dips. It is great to share with the table and you can get all the dips for $17 or have your choice of 5 for $13. Entrees on the Sanaa dinner menu range from $26 to $34. The Grilled New York Strip at $34 is perhaps the most familiar dish on the menu. If you want to try something a little different why not go for the African Inspired Biryani? The vegetarian version is just $19 or if you want to add Shrimp or Chicken this rises to $25. The desserts on the Sanaa menu are pretty heavily biased towards the chocolate lover, so if that is you then you are going to enjoy this. Perhaps the most decadent is the African Triple Mousse. This is Manjari 64% dark chocolate of Madagascar, Jivara milk chocolate, Ivoire white chocolate, chocolate biscuit, and strawberries for $8. The Chocolate Orange Tart is also a delicious combination of blood orange cremeux, chocolate mousse, candied blueberries, and orange gel for $11.50. If chocolate is not your thing then try the Serradura butterscotch pudding. This is an almond coffee streusel, pineapple, mango, and Breton shortbread combination for $7. If you want something a bit lighter you should order the Caramel Ndizi for $7. This is a Banana Financier with Caramelized Milk Chocolate Crémeux, Hazelnut Crunch, Banana-White Chocolate Chantilly, and Ginger Raspberries. 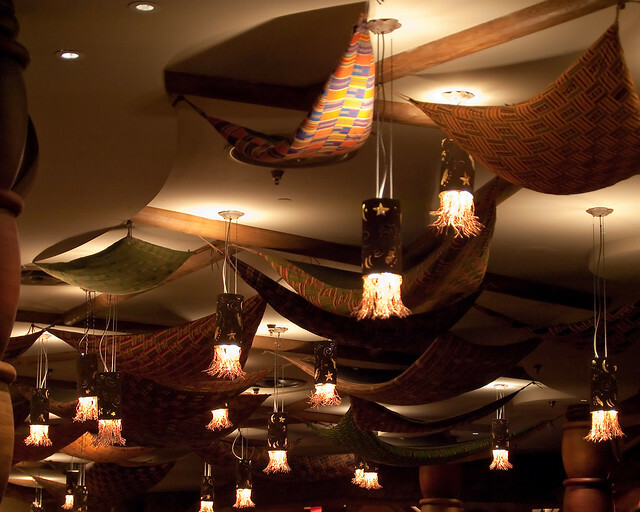 The Sanaa Lounge is another great place to relax inside Animal Kingdom Lodge Kidani Village. It is a relaxing place to sample some fabulous South African wine or beer. Wine flights are available for a reasonable $17 and upwards. There is also a small food menu at the Disney Sanaa Lounge. One thing which we really like is that the Indian Style Bread Service is available in the Sanaa Lounge. The Salad Sampler for $9 is also a good option for a small plate in the Sanaa Lounge. The salads are Chickpeas with Cucumber and Tomato, Watermelon, Cucumber and Fennel, Nigerian Root Vegetable and Citrus. As you would expect, Sanaa Lounge serves some interesting cocktails. You have to try the Malawi Mango Margarita. This is a frozen blend of Tequila, Van der Hum Tangerine Liqueur, Mango Purée, and Freshly Squeezed Lime Juice. 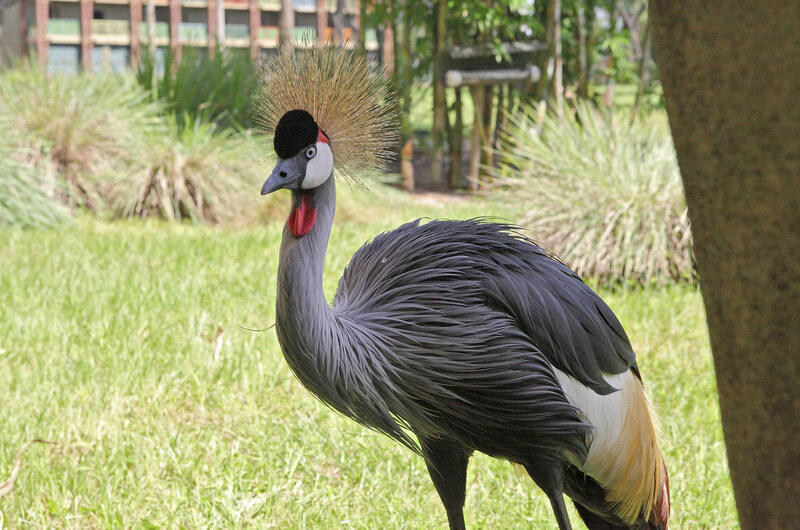 Do you want to learn more about the animals in Disney’s Animal Kingdom Lodge? A great chance to meet with and talk to one of the very knowledgeable animal keepers whilst enjoying a 4-course lunch at Sanaa. The Dine With an Animal Care Specialist runs every day at 11 am at Sanaa. It is limited to just 12 participants so everyone gets a chance to talk to the specialist and ask whatever questions they want to. Children aged 8 and up are welcome. The party is seated at a large table near the picture windows so everyone will get a great view of the animals. The first two courses are served family style. The Indian Bread Service is offered first. Then a Selection of Salads follows. The entrees vary, but there is always a vegan and a vegetarian option. The Dine with An Animal Specialist experience lasts around 3.5 hours and is excellent for anyone wanting to learn more about how the animals are cared for. If you can only choose either Jiko or Sanaa which should you choose? Guests often ask this, but forget that Jiko is considerably more expensive than Sanaa. Jiko is a Signature Dining Experience, but Sanaa just takes one full-service dining credit. We think that Sanaa offers better value than Jiko, but the food is not as good. It is very difficult to compare because Jiko is in general much higher priced than Sanaa. For an Animal Kingdom Hotel restaurant with a view you really can’t beat the experience at Sanaa. Disney’s Animal Kingdom Lodge is a fascinating place to just look around and soak in the amazing architecture and attention to detail. A little known Disney secret is that anyone can sign up for the Animal Kingdom Lodge Culinary Tour. A guide will take you around Boma and Jiko pointing out the architectural details and talking about the food. 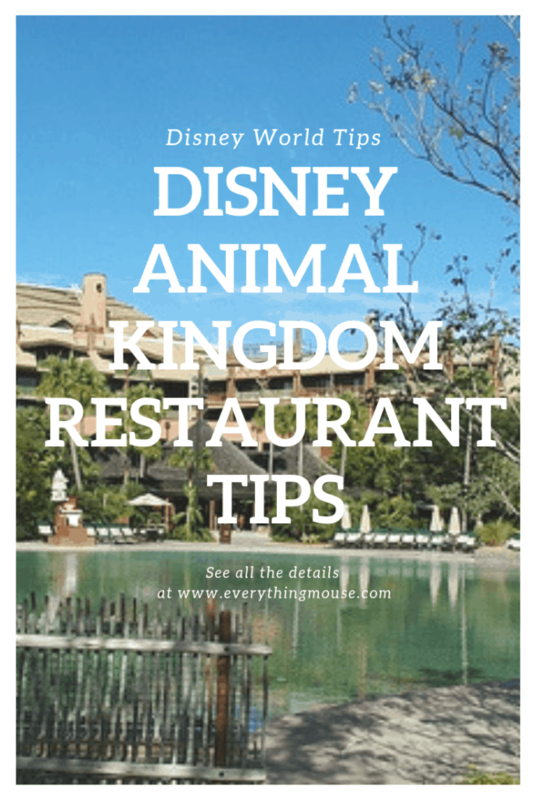 You do not get to talk to the chefs or try any of the food – but this is a great free tour and well worth it if you are spending time at Disney Animal Kingdom Lodge. You do not need to be a guest to sign up for the Animal Kingdom Lodge Culinary Tour. Just meet at the Check-in Desk at Animal Kingdom Lodge a little before 4 pm. Tours run every day. 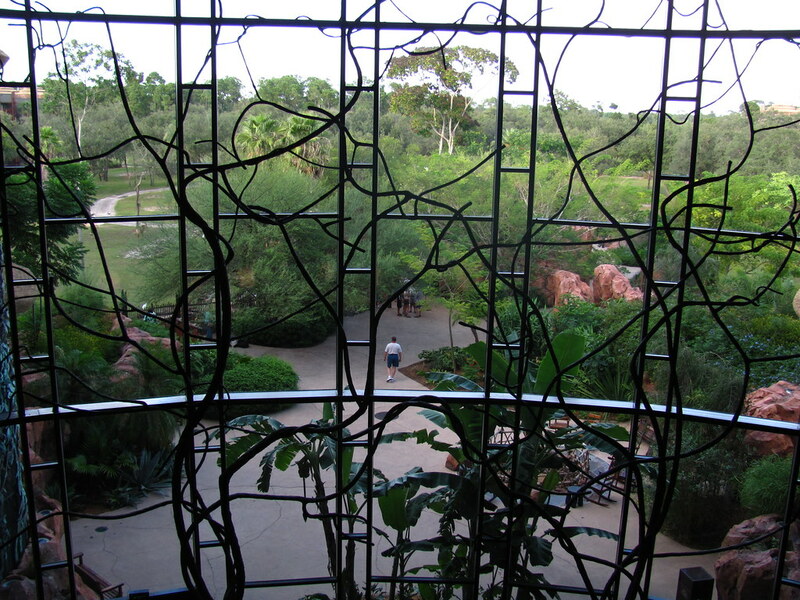 Disney’s Animal Kingdom Hotel is a little out-of-the-way from the main areas of Walt Disney World. It is close to Animal Kingdom Park, but there is no walking path from there. The only way to reach Disney’s Animal Kingdom is by car or bus. If you have your own car and have Advance Dining Reservations for one of the Animal Kingdom Resort Restaurants, you can park for free in the parking lot. Jambo House is the first building you will come to. If you are heading to Kidani Village it is a short drive further on. You can also take a Disney Parks Transportation bus to Animal Kingdom. There are no direct buses between hotels. If you are traveling from a Disney Resort to the Animal Kingdom your best plan is to take a bus to either Disney Springs or The Transport and Ticket Center. You can get a bus to Animal Kingdom Resort from there. 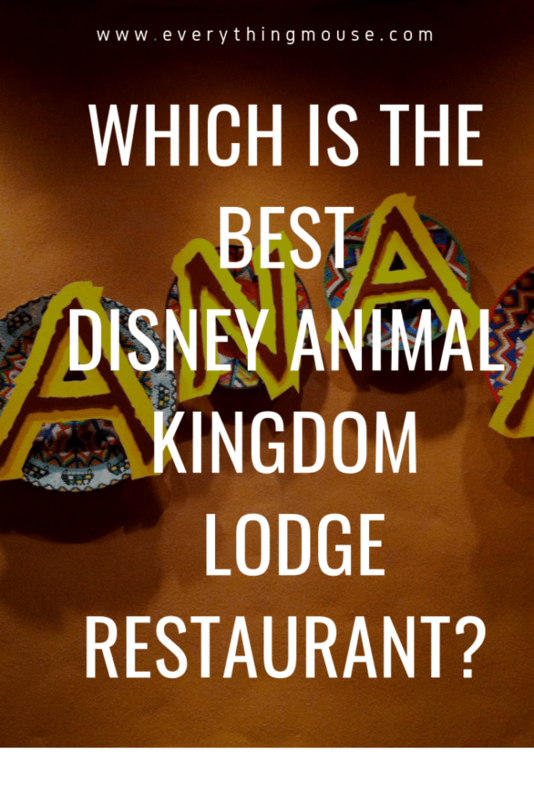 Which is your favorite Animal Kingdom Lodge Hotel Restaurant?